Part 1 of Canadian Genealogy Online contained a general overview of how to research your Canadian ancestors and gave many links to and tips about the records that might be available for searching. Part 2 and Part 3 explored online resources for Alberta and British Columbia and Part 4 provided links to Manitoba resources. Part 5 detailed the history of New Brunswick and its online research resources. Part 6 explored the topic of Newfoundland and Labrador genealogical resources. Part 7 explored the online records of Nova Scotia and Part 8 investigated Ontario online resources for genealogical research. Part 9 presented the smallest province Prince Edward Island. Part 10a introduced Quebec genealogical research methods and some online resources. Because of the many facets of record keeping in Quebec part two (10b) covered genealogical records for Catholic French Canadian ancestors and part three (10c) covered Protestant Canadian research methods and online resources and Part 11 covered Saskatchewan. Today's article will cover Yukon genealogical research and online resources. There are at least two roadblocks to traditional genealogical research in the Yukon. Firstly the indigenous peoples, which according to historians numbered roughly 7,000 inhabitants in 1840, did not have a written language. According to oral traditions the ancestors of these indigenous peoples had lived there for thousands of years. No written language equates to no records to research. Secondly the 1896 discovery of gold caused over 100,000 people - mostly men - from all over the world to stampede to the Yukon to make their fortunes. Many died just getting there, either because of the thousands of miles of treacherous wilderness, the sub-zero blizzards, or the murderous bandits. After just a year these gold seekers left the Yukon and the population dropped to thousands rather than tens of thousands. The challenge to the genealogical researcher is to find if the ancestor you are seeking made it to the area, if they died there, or did they leave the Yukon for other adventures. The discovery of gold in 1896 and the resultant population boom from fortune seekers caused Canada to split the Yukon Territory from the Northwest Territory in 1898. Civil registration however began prior to the organization of the territory in 1896, but was not faithfully observed. 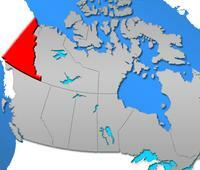 Today the census estimates there are less than 36,000 people in the Yukon Territory. How can you find out if one of your ancestors lived in this wild and rugged wilderness? If your ancestor remained in the Yukon to the year 1901, the census may help. If your ancestor only temporaily lived in the Yukon, you will need to use cemetery, newspaper, and obituary records. The Library and Archive Canada also has the 1901 Canadian Census available for searching online. Yukon Inhabitants A good stategy for reseachers who have male ancestors that have gone missing around 1898, the year of the Gold Rush, would be to check the many Yukon residents databases that have been compiled for this time period and beyond. As you can see from these databases "Stampeders" came from all over the world. The following are links to databases which list inhabitants of the Yukon Territory since before its inception. The Yukon Genealogy is probably the largest. "The beginnings of this list were compiled by a Mrs. M.L. Ferguson of Los Angeles, who first visited Dawson City in 1899." Since there were no street names or addresses, she was unable to deliver letters entrusted to her. To overcome this problem, Ferguson was inspired to publish the Directory and Gazetteer of the Yukon Territory. After Mrs. Ferguson passed, it was published by Barnes & Baber. MyTrees.com has provided an extraction of the 24,200 Alaska-Yukon goldrush participants in its Books and Records Search. These names come from the "The Only Yukon-Alaska Directory for 1901" published by Barnes & Baber. This database includes the occupation of the individual and the place where they lived in that time period. 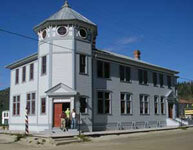 At the Valdez Museum Historical Archive you can search the "Gold Rush Names Database" which includes 8000+ records. Alaska Gold Rush History and Genealogy features several lists that contain the names of pioneer prospectors, miners, trappers, merchants, military and others that have spent time in Alaska, or were part of the gold rush to the Klondike, from about 1867 (when Alaska was purchased from Russia) through about the 1950s. The names come from books, mineral and other government reports including military information, family members and censes rolls. Since civil registrations were so unreliable the most likely place for a researcher to find an ancestor's vital information would be from cemetery records. However not all cemetery records are complete either, so many researchers use newspaper obituaries to get the facts of an ancestor's life. Many of the websites previously sited in this article contain cemetery and obituary databases. Another website worth mentioning is the ExploreNorth.com. It features many Yukon and Alaska databases including these Northern Cemeteries and Graves - Yukon, Alaska, BC, and the NWT and Artic and Northern Biographies. The Alaska State Library features a book by Betty J. Miller which contains vital records of Alaska and Yukon that were copied from the Weekly Douglas Island Newspaper and Strollers. I have not included in this article the online genealogical resources for the Indigenous Peoples of the Yukon. I am including a link to an article at the "Library and Archive Canada" titled "Aboriginal Genealogy" I believe it does a superb job of outlining the procedure for tracking your First Nations ancestors. If you know of additional online resources that I have not mentioned, please send them to newsletter@mytrees.com and I will include the reference in an upcoming newsletter. Copyright ©: 2018 Cindy Carman. All rights reserved. No printed reproduction of this article may be used without the express written permission of the author. Links to this article are encouraged.